Taipei, the capital of Taiwan, with the famous Taipei 101 tower, countless restaurants and so much things to see and do. I’m not usually one to spend a long time in a big city, but I absolutely loved our 12 days in Taipei! How to get around in Taipei. 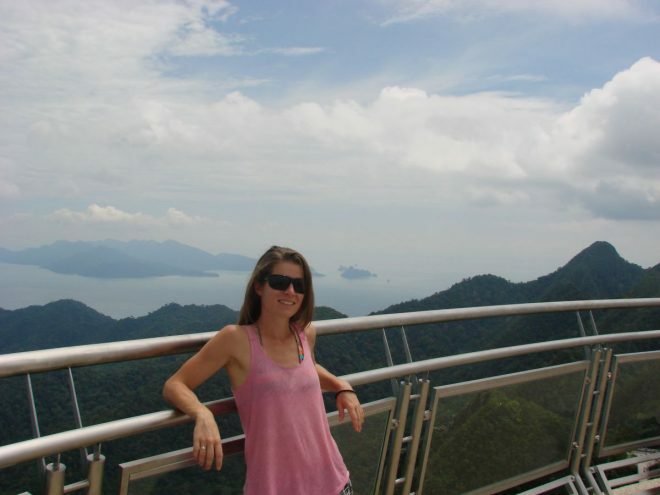 One of the best Taipei activities is hiking to the top of the Elephant Mountain. It’s a relatively easy 15 minute hike to the top of this 183 meter high hill, but I was still very sweaty at the top because of the humidity. Nevertheless, the views over Taipei are amazing! I’ve seen a lot of temples, but really liked our visit to the Confucius Temple because of the interesting (and fun) 4D shows about the history of Confucianism and the temple itself. Since we were already in the area we also visited the beautifully renovated Dalongdong Baoan temple (next to the Confucius Temple). Lots of Chinese shops, colorful boutique hotels and artsy places to explore! We arrived too late to go to the roof top terrace but the outside was beautiful as well! The Chang Kai-Shek Memorial Hall is huge, I felt so teeny tiny in comparison… Don’t miss the changing of the guards (on the hour from 10am to 4pm). One of the best things to do in Taipei is a visit to the Gate of Great Centrality and Perfect Uprightness (such an original name;-). The lights went on at 7pm and made for a beautiful sight! The National Concert Hall and the National Theater are also part of the Chang Kai-Shek complex and are equally impressive buildings. We visited the Chang Kai-Shek Memorial complex on a busy night and I enjoyed just sitting there and do some people watching. Another fun thing to do in Taipei is a visit to Huashan 1914 Creative Park. There are lots of cafes, fancy restaurants and exhibitions. And some very green buildings! Our visit to Taipei coincided with the 2017 Dragon Boat Festival, lucky us! It was a lot of fun to visit this annual festival held at Dajia Riverside Park. The weather was great and so was the festive atmosphere. I’m not that much of an art lover, however, I do like beautiful buildings and the National Palace Museum is certainly one that falls into this category. Even though the museum is enormous, it’s still not nearly big enough to display the entire collection of the museum (entrance fee is 250NT per person). The National Dr. Sun Yat-sen Memorial Hall is another massive construction (29,464 square meters! ), they don’t do small buildings in Taiwan?. A great day trip from Taipei is Tamsui (at the end of the red subway line). There are many things to see in this lovely suburb by the ocean. 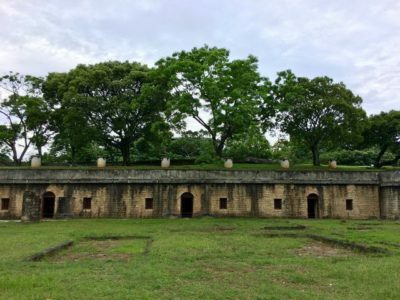 Pictured clockwise: the beautiful former British Consulate Residence, me with the general at Fort San Domingo, Hobe Fort and the pretty Customs Officers’ Residence. One of my favorite countries in the world is Japan and the suburb Beitou strongly reminder me of Japan. Not surprising since this area was developed during the Japanese rule in Taiwan. The Japanese love their hot springs and Beitou happens to be an area with thermal activity. There is lots to see and do in this little village and we spent a full day here. Pictured clockwise: Beitou hot spring museum, the thermal valley with a mysterious steaming lake, calligraphy in the Plum Garden and Beitou public library. Wulai was recommended to us by several locals and if it had not been pouring we probably would have stayed the entire day. We did not let the rain keep us from walking to the Wulai waterfall, but a longer hike (there are several in the area) did not seem like the best idea. Wulai is beautiful though, the water has an amazing blue color and the forest is super green. Probably from all the rain?. We forgot to check the schedule of the gondola (a little heads up: it’s closed on Mondays) and took the bus to Maokong village instead (leaves from Taipei Zoo MRT station, 15NT). From the village we hiked to the Silver Stream Waterfall, also called the Yinhe Cave. We didn’t come across anyone during our hike! The Shangri-La is the tallest hotel in Taipei and their Marco Polo bar offers a grand view of the city and Taipei 101. They have an amazing selection of cocktails made with typical Taiwanese fruits such as taro and wax apple. The perfect place to have a drink! For me food is one of the most important reasons to travel and the Italian dinner at we had at the Marco Polo restaurant in the Shangri-La hotel was absolutely amazing. Each dish was beautifully presented and created with so much love and attention to detail. From the locally sourced mozzarella (made by the only Taiwanese artisan cheese shop, the owner learned how to make the perfect cheese in Italy) to the olive oil cake (for which the recipe was handed down to the chef by his Italian grandmother), everything was delicious! You can read more about my obsession with Abura Soba in this post, but the short version: this is my favorite dish in the entire world! Whenever we are in big city with Japanese restaurants the first thing I do is scour the internet to see if there is one selling abura soba. In Taipei there was and it was delicious… You can find more information and the address here. Oh these dumplings… Best. Dumplings. Ever. This local shop is run by a very friendly family and quite famous in the area, every morning people would queue up to get their daily dumpling dose. We gladly joined the queue because these dumplings are simply divine. A basket of 8 dumplings costs 50NT (a lot less than at Din Tai Fung). Check out their Facebook page here. To burn off all that delicious food, we used the Youbike (Taipei’s public bike rental system) a lot! A great place for cycling is the bicycle path along the river, you can go all the way to Tamsui! Things to do in Taipei: where to find them? I marked all the Taipei attractions and highlights mentioned above in this map so it’s easy for you to find them. I also added the Airbnbs we stayed at and transport information (Taoyuan airport, MRT and Youbike stations). Here is a short breakdown of our average daily expenses in Taipei. We spent 12 days in Taipei in total and as you can see above we did a lot of sightseeing in and around the capital city. We also ate lots of delicious food, traveled by MRT and Youbike and stayed at 2 really nice places via Airbnb. How much did we spent per day for us as a couple? 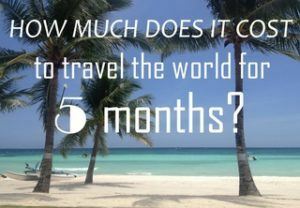 Only €55 per day! In the table below you can see how we spent our money in Taipei. We stayed at Jemma’s place for 3 nights (€25 per night) and at David’s place for 9 nights (€17-21 per night). Read more about our accommodation in this post. The MRT in Taipei is really cheap, even when we went all the way to Tamsui (at the end of the red line) we only paid 40NT for the ride. Besides the MRT we also used Youbikes to get around. In order to use these bikes you have to register, you can read more about the Youbike system here. Don’t forget to download the app, it’s in Chinese but you’ll still be able to use the map with all the Youbike stations. I already wrote about the best food we had in Taipei. As you can see in the budget breakdown we spent most of our money on food, but that only makes sense in Taipei: the capital of food? 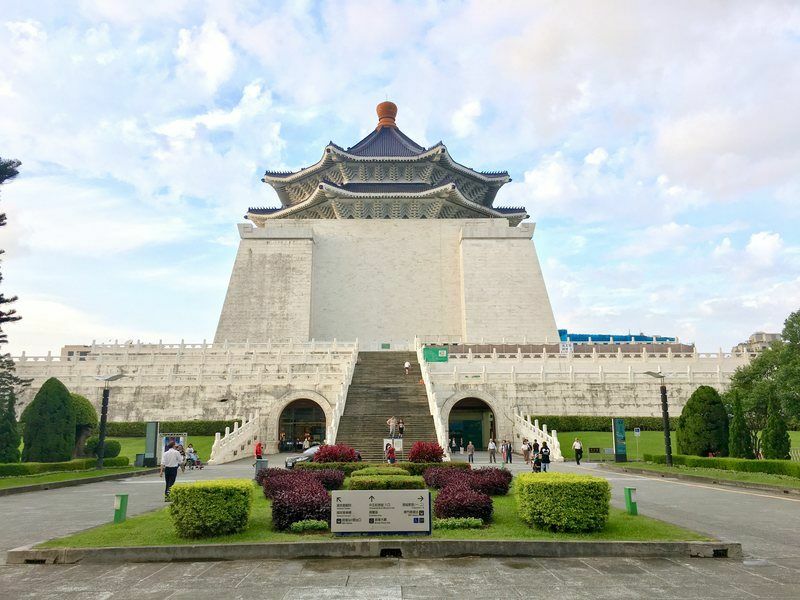 As you have seen in this post there are lots of places to visit in Taipei! The only paid activities we did were going to the movies (270NT per person) and visiting the British Consulate Residence, Fort San Domingo and Hobe Fort in Tamsui (80NT per person for a combination ticket offering entrance to these 3 sites). The rest of the things we did were free! You can download the list of things to do in Taipei below. I hope this Taipei travel guide has given you inspiration what to do in Taipei! Do you want to read more about traveling in Taiwan? Check out my other posts here. Chowing down on those dumplings is on my list Lotte. Awesome things to do. We just laid over at Novatel at the airport nearly 6 years ago when flying to Bali. The place had a mysterious, special air to it. Cannot wait to get back. Thank you so much Ryan! Those dumplings were drool-worthy, so good yet so simple… If you get the chance to visit Taiwan, it’s absolutely worth it! As amazing and precise as always! What a wonderful set of pictures – like the ones of hike, those are beautiful!! Do you still do them with your iPhone or did you invest in a camera? Or maybe does your husband have a camera himself? Yep, then I can safely say that the iPhone does take very neat pictures. The ones of the mountains of the Himalaya hike were simply fantastic! Thank you again for giving us the ability to travel with you from your blog! Thank you so much for following me along my journey:-). I’m very happy with the picture quality of my iPhone. But then again, it’s almost impossible not to take beautiful photos in the Himalayas, it’s absolutely gorgeous! Awesome post! It definitely looks like a cool city to check out. I am looking at moving there for a bit next year so this was very informative. I’ll be sure to check out some more of your blog! Oh that’s so cool! Taipei is definitely one of my favorite cities in the world:-) Have an amazing time living there and enjoy the delicious food, beautiful nature and friendly people of Taiwan.